Explore the ancient remains at the La Brea Tar Pits in Los Angeles with a modern form of transportation — the Segway! The convenient personal transport vehicle makes it easy to get around this popular and intriguing site and see the remains of prehistoric animals such as mastodons, mammoths and ground sloths. Learn all about the history and scientific significance of the tar pits from your informative guide during your morning or afternoon tour of this off-the-beaten-track attraction. Meet your guide in central Los Angeles to begin your exciting Segway tour. After a safety briefing, hop aboard your Segway for an instructional session. Riding a Segway is easy to learn, and in no time you'll be ready to glide the short distance to the La Brea Tar Pits to begin your exploration of the ancient site. This unusual attraction in the heart of Los Angeles features the remains of animals from the Pleistocene Era (a time period that spanned from 2.6 million to 11,700 years ago) trapped in natural asphalt oozing up from the ground. Cruise around the site on your Segway, listening to your guide discuss the history of the pits and the many fossils that have been discovered there. Marvel at actual bones from prehistoric mammals such as mammoths, mastodons, saber-toothed cats, camelops, dire wolves, ground sloths, North American lions and short-faced bears unearthed through ongoing excavations. Hear about how settlers in early Los Angeles used the tar from the pits for fuel and building materials. Keep your energy up with complimentary bottled water and chips, and pause for fascinating photo ops of reconstructed scenes with Ice Age animals throughout your tour. 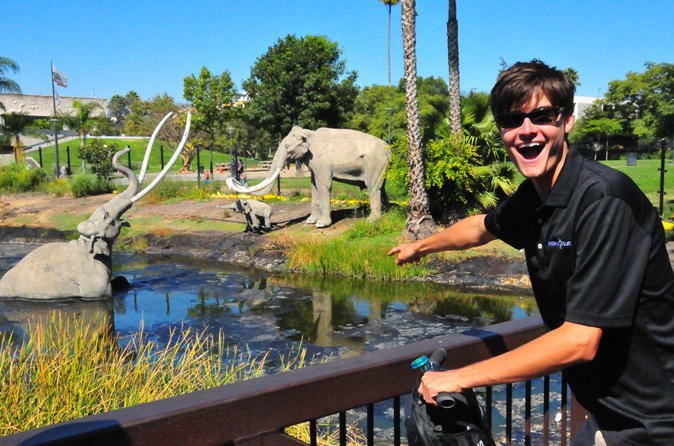 Your 2-hour Segway tour of the La Brea Tar Pits concludes where it began in central Los Angeles.